Now that we are heading into cooler weather, soup is beginning to look good again. Here’s a tasty and fun soup that inspired my imagination because it immediately reminded me of my old favorite, Won Ton Soup—without all the work that goes into it. I must be getting lazy. I’ve always enjoyed won ton making and have viewed the process of filling and folding and pressing each little won ton as relaxing and meditative. I was intrigued; the further I studied the recipe, the more it resembled Won Ton Soup with its similar components, but lacked the cute little dumplings. Perhaps this deconstructed version would yield a similar outcome without the fuss… I was all over it! 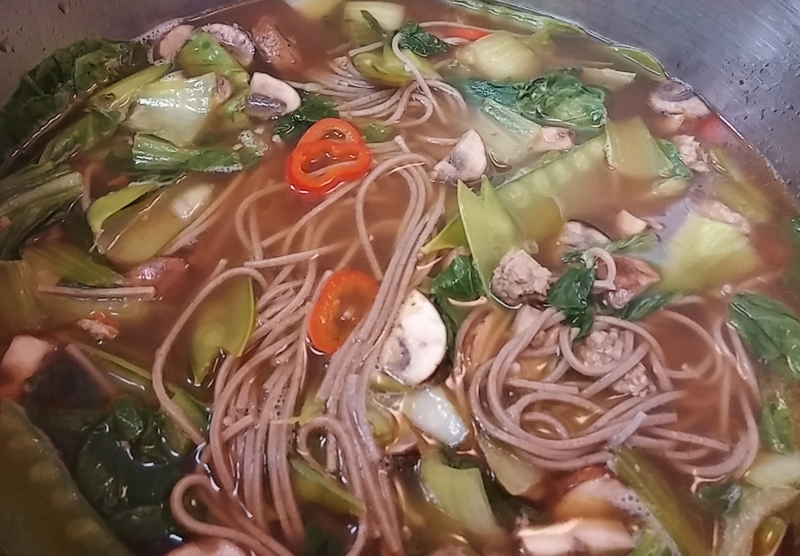 Credit for this soup goes to Jessie Price’s recipe Brothy Chinese Noodles in The Simple Art of EatingWell, where it is described as being inspired by Chinese Dan noodles. Upon further investigation I learned that Sichuan Dan Dan Noodles are known for being spicy hot and frequently are served with very little broth. For more background on Dan Dan Noodles, see Appetite for China. With soup on my brain, I certainly wasn’t disappointed with EatingWell’s variation; it was beyond everything I had imagined. 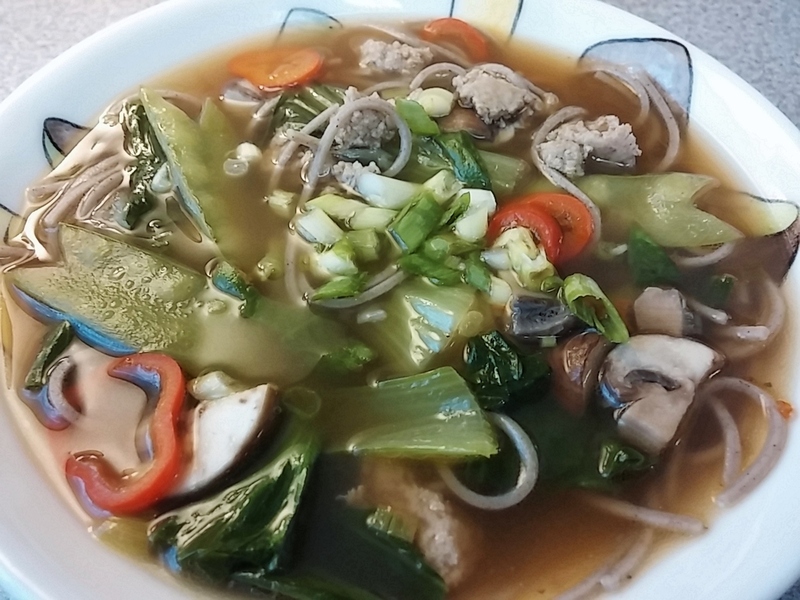 The soup broth has more flavor than my usual Won Ton Soup because it begins with ground turkey (beef or pork) broken into large chunks, browned in sesame oil along with ginger, garlic, and scallions, and then it is all removed. The stock is built on the lovely brown bits left in the bottom of the pot and further enhanced by soy sauce and rice vinegar. With the Chinese penchant for perfectly clear stock, this might appear a bad idea, but since the soup is already filled with chunks of ground meat, it really doesn’t matter. I added bok choy, hot peppers and other vegetables that would cook quickly along with the noodles. I opted for my current favorite, somen noodles, which gave the soup an even deeper, heartier flavor. A zesty soup that calls for slurping; inspired by Brothy Chinese Noodles in The Simple Art of EatingWell by Jessie Price. In a large saucepan, heat sesame oil over medium heat. Add turkey, ½ cup scallions, garlic and ginger, stirring gently to break up turkey, but keep some clumps. Add the sliced mushrooms and cook until no liquid remains. Remove to a bowl. Deglaze the pan with a little broth, scraping to loosen bits of meat adhering to bottom of pan. Over medium heat, add all the broth and the vegetables as they are cut up. When it comes to a boil, add the noodles and the turkey mixture, reduce heat slightly and stir occasionally until the noodles are tender, 3 to 5 minutes. Adjust seasoning and serve topped with scallions and cucumber. Serves 6.